Marina Nani is the Founder of Radio W.O.R.K.S. World, and the chief editor of two publications (The Quantum of Light and Sovereign Magazine), and authored 56 books. As Founder and Executive Director of Radio Works World and Broadcast Your Passion TV Marina sets out to create one million female entrepreneurs. Together with her team, she created the MTN Network that consists of brand journalist she trained to broadcast from around the world. While others see her as an accomplished author, she considers herself to be The Good News Channel, helping people embrace their truth and understand their true worth. Marina Nani retired in 2012 and become an advocate for human brilliancy, embarking on a 1000 day, around-the-world book tour where she met amazing people and total strangers, including herself. Her story begins with the first story she ever shared, leading her to the realisation that each of us is born with unique qualities and talents, which unless developed, puts individuals and society at a great loss. Human beings are givers by nature and most of the time, they do not receive the recognition they deserve. Now, Social Edification is building up purposeful leaders around the world. 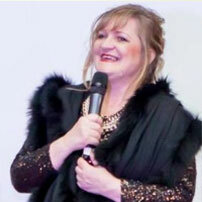 Her Team helps individuals to BE the good news by utilising live events, radio, 2 publications (Sovereign Magazine and Quantum Of Light) and a TV channel, BYP TV (Broadcast Your Passion TV) to raise profiles and exposure, giving unique and inspirational leaders a platform from which they can attract and interact with a fast growing vibrant audience. Marina and her team have already hosted over 30 red-carpet events, including Authors Awards at Universal City/ Hollywood, Authors Awards at BAFTA’s and Stardust Awards at Royal HorseGuard Hotel and other landmark location, to raise awareness and empower women and men who are working together for the greater good. Through her Social Edification initiative, Marina has celebrated and honoured over 2000 women who are making a significant difference in the world and the best stories are published in her latest book series as well as other projects currently under development. For example, her latest project is the book series “Your Stardust Story- 1001 Inspirational Story from around the world” which gives all the guests featured on her show the chance to become a published author and be recognised globally. Marina’s aim is to empower women and help society recognise and celebrate women in 2018 by honouring them at The Authors Awards, Stardust Awards and Media Awards for storytellers, brand journalists and broadcasters to inspire modern society and new generations to find their Inner Peace. Marina is a great believer that “Peace starts with you” and every human being comes from, Stardust. They include those women who are facing challenges as well as those who are successful to create inspiring possibilities, regardless where they are coming from.